Campanula is a mascot, a symbol of good luck,Wind chimes blowing, bringing great sound, and pleasing, self-cultivation.Hanging wind chimes, can bless his family safe, healthy and happy, Suitable for Home decoration, decorations/Hanging on the door, the windows/Hanging in the room, anywhere you want.An Perfect gift for your friend.Bamboo wind chimes, natural handmade, fine workmanship, generous decency.Crisp bamboo wind chimes, look like fresh, sweet voice.Empty pipe bamboos hit bamboo piece, Issued a sound muffled.There are 6 bamboos, different lengths will make different sounds.The sound are clear pleasing, like a bunch of notes.Material: BambooColor: BrownTotal length: about 60cm, Width: 13.5cmPackage includes: 1 x Bamboo Wind ChimesNote: Light shooting an. Wind chimes blowing, bringing great sound, and pleasing, self-cultivationHanging wind chimes, can bless his family safe, healthy and happyNecessary small decoration for homeWhether for personal use or for a friend, is a good choiceThe 8 tubes wind chimes, when the breeze is blowing,The wind swinging the bells, sounds sweet, charmingMeaning access to love,safe, healthy and smoothPlaced there are special landscapeSuitable forHome decoration, decorations; Hanging on the door, the windows; Hanging in the roomColor: photo colorMaterial: wood metalsize: 63cm*8cmPackage Contents: 1 x Wind ChimeOnly the above package content, other products are not included.Note: Light shooting and different displays may cause the color of the item in the picture a little different . Gesamtlänge des Windspiels ca. 100cm. Größe der Bambus Röhren ca. 40cm. Guter Klang. UNIKAT Holz ist nicht gleich Holz ! Auch Verwerfungen und Verziehen so wie vorhandene und neu entstandene Rissbildungen sind kein Reklamationsgrund bei diesen Naturprodukt, den Holz Arbeitet sein Leben lang und reagiert auf Klimaänderungen und Raumfeuchtigkeit. IDEAL FOR YOGA OR REIKI. RAINBOW COLOURED. View Our Categories. Toy, Children & Baby. Health, Beauty & Dental. Travel, Sport & Leisure. At Onogo, we strive to move with the world and all of its advances. Up to 6 hours of light. Overall hanging length: 74cm. We are here to help. RRP £30 Iron Stop Gazing Ball 3D HUMMINGBIRD. 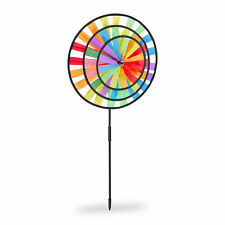 Can be used on it's own or hung from the bottom of a wind spinner, indoors or outdoors. Topper & Twister just unhook so you an mix & match with any other Spinners & Twisters you have. Decorative crackle finish ball combines light with sound to provide a relaxing atmosphere in your garden. Complete with remote solar panel. 2 x polycrystal solar panel. Colour Changing LED. Add a cute decorative lighting piece to your garden with this magical fairy. Solar Panel: Polycrystalline 4.3x2.5cm. Colour Changing LED. Hand Finished Details. Zaphir Klangspiel. Vier in den Stimmungen der Jahreszeiten ein Neutrales. Material Korpus: Bambusfurnier. Durch leichte Bewegung des Klangspiels wird ein kleiner Klöppel auf die Klangstäbe angeschlagen. 100cm Windspiel Holz Bambus Kokosnuss Elefant Feng Shui. Seit über 30 Jahren Erfolgreich. Nun auch in der zweiten Generation! Windspiel von der Insel der Götter in Bali Indonesien. Das Windspiel hat einen guten Klang. Solor Power features a unique design with six color changing hummingbird hanging under the wire that illuminates at night. Hook to easily hang from trees, fences, patio, garden, lawn, living room, bedroom and other features. The coconut and the bamboo are varnished to make them suitable for outdoor use. Approx total hanging length from hanging hook to the bottom of the wind catcher is 66 cm ( this can be reduced by shortening the string if required). BEAUTIFUL 'STRING OF MIRROR BUTTERFLIES' SUN CATCHER! The Chimes of Polaris is named for the North Star, which serves to mark Earth's celestial North Pole. Tuned to an ancient pentatonic scale, the Chimes of Polaris harmonizes beautifully with our best selling Encore Chimes. 5 aluminum tubes. These chimes may not be sold into Canada. In Use Dim: 5.00" x 5.00" x 22.0. 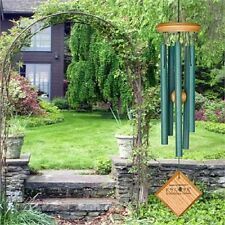 Kingfisher Wind Chime 56cm Long Suncatcher Mobile Garden Home Porch Window. Woodstock Encore Windchime. Chimes of Mercury. Bronze Tubes. Material: Bubinga finish wood, 5 bronze aluminum tubes. RRP £21.99 - Iron Stop 34cm. CLEARANCE SALE - RRP £21.99. SILVER AMBER CRYSTAL TWISTER Hook Garden. A great item for decor outside as well as inside. A nice addition to any lawn or garden. Sparkling powder coating. Each Crystal Twister is 34cm tall (approx 13.5"). This hypnotizing Classic copper twister with Blue crystals is an intriguing addition to any wind spinner or by itself. Watch as the crystals climb to the top or as they try to squeeze out of the bottom while spinning in the light breeze. Large Mandala and Leaves Hanging Decor. Bell made from cast iron. Decorated with elegant scrolls at the top and four swooping birds, each hanging on a chain. Material Korpus: Bambusfurnier. Koshi Klangspiel. und nicht als Windspiel entwickelt. Ihre Klänge sind bewußt sanft und sollen beruhigend und unaufdringlich sein. Halten Sie das Klangspiel an der oberen Kordel und bewegen es sanft: der kristallklare, entspannende Klang wird Sie verzaubern. This beautiful multicoloured Hummingbird windchime will instantly brighten up any garden or outdoor space.This item is ethically sourced. H75cm X W21cm X D10cm. Wind Spinner Sun Catcher. Small 6"/15cm GALAXY Stainless Steel Wind Spinner/Sun Catcher by Shudehill Giftware. 6"/15cm GALAXY Stainless Steel. See the "how to open a wind spinner" in less than 60 secs video. These are long and very difficult to photograph, bigger that they look. the pics just don't do justice. Nice gift😊. 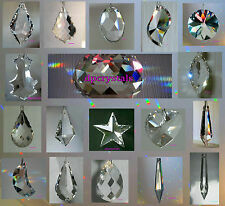 •Feng shui Item: Used in feng shui to lighten the chi of a room letting in only good energy. Moreover, factors such as humidity, temperature change and high exposure to heat from lighting sources do not alter the gloss or everlasting shine of these unique crystals. (#352527004722). Heavy quality and very long, difficult to photograph, the pics just don't do justice. Great gift 😃. Wonderful item, great quality, bigger and better than expected! Very happy. BNIB Stained Glass Two Bullfinches on Branch Wind Chimes/Suncatchers- Nice Gift! Very difficult to photograph, bigger that they look. the pics just don't do justice. Lovely gift 😊. Nice Gift! 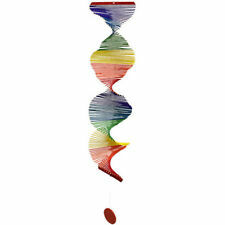 LARGE 12"/30cm SILVER SWIRL Stainless Steel Wind Spinner/Sun Catcher by Shudehill Giftware. Stainless Steel Wind Spinner. Sun Catcher Hook Garden Gift. See the "how to open a wind spinner" in less than 60 secs video. DieCIM Petite 2 in 1 Windspiel Serie besticht durch ihre doppelte Funktionalität.Die Windspiele können sowohl mit Haken und Schnur hängend, als auch mit Standstab als Gartenstecker dekoriert werden. FACTORY CLEARANCE SALE - RRP £21.99. A great item for decor outside as well as inside. A nice addition to any lawn or garden. Sparkling powder coating. Eye-catching. Crafted using found wood such as driftwood and fallen branches. HANDCRAFTED COLORED HAND-CUT GLASS LEAVES. Food & Beverage. If there is a problem, we will try to solve it. We strive to operate by the GOLDEN RULE with fairness, honesty and integrity. Perfect for adding a touch of the jungle to any room! Features foliage, toucans and parrots. Handmade and Fair Trade. On the hanging paper the Japanese kanji characters say. hobby on the other! Blue wash finish wood. 5 Silver tubes. Seed Feeders. We strive to operate by the GOLDEN RULE with fairness, honesty and integrity. If there is a problem, we will try to solve it. Quality Products, Reasonable Prices & Fast Friendly Service!